Cllr. Kieran Dennison: Irish Rail agrees to rename the Phoenix Park Rail Station. Irish Rail agrees to rename the Phoenix Park Rail Station. Last year the Sunday Tribune highlighted my calls for Irish Rail to change the name of the Phoenix Park Station. 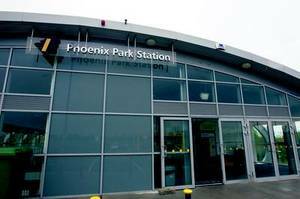 The station was built to facilitate the residential development on the old Phoenix Park racecourse site, but there have been reports that the name has caused some confusion for customers and especially tourists, visiting the Phoenix Park, which is 2km away. I am delighted now that they have decided to change their minds on the matter. Irish Rail are asking their customers what they think and whether they have suggestions for a new name for the station. You can let them know via twitter @irishrail or by following Irish Rail on Facebook and commenting there. They say their policy is to name stations by reference to the geographic area the station serves, and not after individuals or groups. Phoenix Park Station opened in January 2008 on the Maynooth-Dublin commuter line, between Castleknock and Ashtown Stations. It is served by 40 trains in each direction to and from the city. There is a 100-space park and ride facility at the station also.